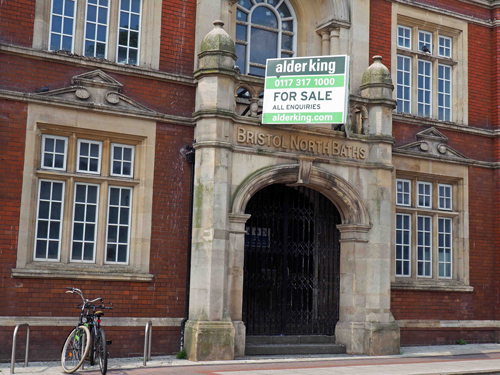 A company that is in the process of purchasing the Bristol North Baths on Gloucester Road from Bristol City Council has been granted planning permission to convert the building into offices on the condition that original, historic fixtures are retained. Berkeley Place, a property company based in Clifton run by managing director Nick Cryer, will seek to bring back into use the Grade II Listed building which has been vacant for 13 years. The proposed change from swimming pool (Class D2) to office (Class B1) 18/05513/F was granted by planning officers on December 17. The proposals are for the building which dates from 1915 to be converted into offices with one leading Bristol based company leasing the first floor and the ground floor providing smaller offices for local SMEs, startups and businesses around a central café and break out area. For many years the building was being developed into a health centre, complete with hydrotherapy pool as part of the Bristol North Baths Project. After long delays to the work the original developer, Chatsworth Homes, ran into financial difficulties in 2015 and the scheme ground to a halt. The former baths were not completed, but the new Bishopston Library and ten apartments were opened in 2017. The developers referred to this in the planning documents stating: “Whilst we empathise with the disappointment of the baths closing and latterly the non-completion of the health centre, these new proposals seek to bring back into use the Grade II-listed building, which has sat vacant for 13 years. Berkeley Place will be working with Gloucester Road-based architects Cryer and Coe, who have drawn up the design for the building. As well as alterations internally to the building there are plans to create 12 car parking spaces, including one accessible as well as three motorcycle spaces, and secure cycle storage and additional bike racks at the front.